These pizza inspired meatballs are filled with pepperonis, pizza sauce and onions. Whole30, Keto, Clean Eating, and Paleo. These meatballs are perfect for meal prep, family dinner or a social gathering. Lazy weekends used to mean grabbing a big fat pizza, beer and any other goodies I could get my hands on. I used to constantly view food as a reward. If I was a “good girl” all week long, I would reward myself on Friday with as many unhealthy treats I could fit in my mouth. 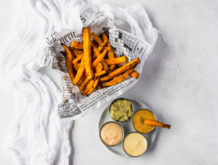 Since changing my mindset on food and living the Paleo lifestyle, I have come to realize that I can still enjoy a fun Friday night meal in a much healthier way. Pizza is one of those comfort foods that I crave on a regular basis, but instead of indulging in a greasy slice of pizza, I decided to create an easy, flavorful and delicious pizza meatball recipe. Not only are these heavenly, but they are also Whole30, Keto and Paleo complaint along with being gluten and dairy free. 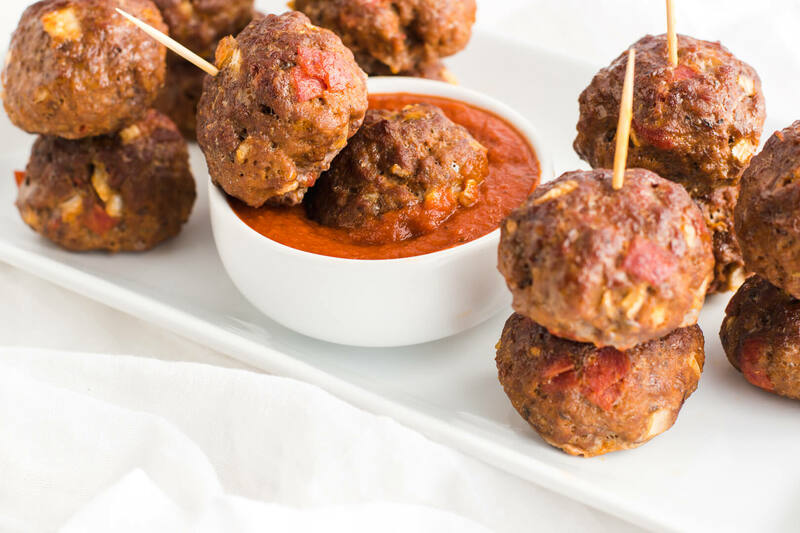 Talk about hitting the spot, these cute little pizza meatball bites are an amazing weekend treat that the whole family will love. Here comes the good news, my 4-year-old devours them and can’t stop dipping them in pizza sauce and popping them in her mouth. I will serve these with some type of steamed veggie or a nice green mixed salad and it makes the perfect busy weekend night or cozy weekend meal. These meatballs are so easy to make and can be whipped up and on the kitchen table in no time at all. I will mix some ground beef (from Butcher Box) mixed with onions, pizza sauce, tapioca flour, pepperonis and a mixture of seasonings make the perfect yummy meatball. If you are completing a Whole30, compliant pepperonis may be really hard to find so just omit.I promise they will still taste good! Where can I find compliant Whole30 pizza sauce? You can find a lot of pizza sauces at the store that are compliant, but if you can’t, check below for my Paleo Pizza Sauce recipe. Not only can you serve these cute little babies as a family meal, but these can also serve as the perfect appetizer for football Sundays, Super Bowl or any other social gathering. In addition, they are perfect for meals during the week. Prep a batch on Sunday and either freeze or throw in the fridge for easy to grab snacks or meals. Is pepperonis considered Whole30 compliant? It is not likely that you will find clean pepperonis to enjoy while on your Whole30. Pepperonis are usually highly processed and you will probably be better off branching out and looking for other options during this time. If you are wanting to enjoy these meatballs during your Whole30 just simply remove the pepperonis. I promise they still are super flavorful and delicious. Preheat the oven to 400° and line a baking sheet with parchment paper. In a large mixing bowl, combine hamburger meat egg, onions, seasoning, salt, pepperonis, pizza sauce and tapioca flour. Mix until everything is completely combined. Add all ingredients to a medium size sauce pan and whisk together. Turn to medium/high heat and use a wooden spoon to stir occasionally as it cooks. Serve immediately or store in fridge for up to 1 week. Do you use all 1 1/2 cups of pizza sauce in the meatballs? You say to use ant left over sauce for dipping. You use 1 1/4 cup in the meatballs and the 1/4 cup of leftover for dipping. Made these tonight and my three year old ate hers and the ones on my plate as well. Definitely a winner! I am so glad to hear that! Thank you so much for letting me know you loved them! I am so happy to hear you guys loved them! I couldn’t find tapioca flour at my grocery store and I want to make these tonight! Do you think arrowroot flour would be a good sub? Yes Arrowroot will be perfect!